#23 Fatal Ascension and #24 The Afterlife. I've destroyed many myths in EVE, like "solo/small gang is dead", "the biggest enemies of coalitions are other coalitions", "WH is the deadliest place of EVE", "CFC members are PvP-ers", "NPC/lowsec pirates are irrelevant". But today I hit an even bigger one, one that is ingrained the deepest: the myth of the veterans. It exists in many forms, like crying over skillpoints, paternalistic help of newbies and the legendary "you must kiss the ring". All of them mean the same: old players are much more powerful than new ones and the new ones depend on the old ones to survive. Admit it, you've blamed defeats on skillpoints! Newcomers: those who did no damage in 2013 but did in 2014. Damages below 0.1B/year were rounded to zero, by doing so only 1% of the damage was lost. This was needed both to save computing time and also to properly classify players who did some trivial damage in 2013 as newcomers. Progressing: those who did damage in 2013 but did more in 2014. Bittervet: those who did damage in 2013 and did less in 2014. Quiting: those who did damage in 2013 and didn't in 2014. According to the myth, #1 can be populous by lots of wide eyed newbies, but their damage will be miniscule as they are still riding frigs and maybe T1 cruisers. #2 is the norm, veterans became more powerful. #3 is a small anomaly of players as they should progress or quit and #4 is irrelevant for our analysis, since they no longer play. Let's see the numbers: At first, ouch! 45% of the pilots who were killing ships in 2013 quit the game or at least stopped doing PvP actively in 2014. However they were fully replaced by newbies. Did you expect such rotation in the game? I sure didn't. Secondly, the newbies are better than the bittervets and the several-years old and still progressing veterans are only 5x stronger. Sure, that's not nothing, but also doesn't make them useless and at the mercy of the veterans. Also, this number is arbitrary, as "progressing veteran" can only be declared post-year. At the start of 2014 there was no way to know if a 2013 PvPer will keep progressing, go bitter or quit. The average performance of "2013 veterans" in 2014 is 2.6B/year. Most newbies didn't start to play on Jan 1, while all veterans did. 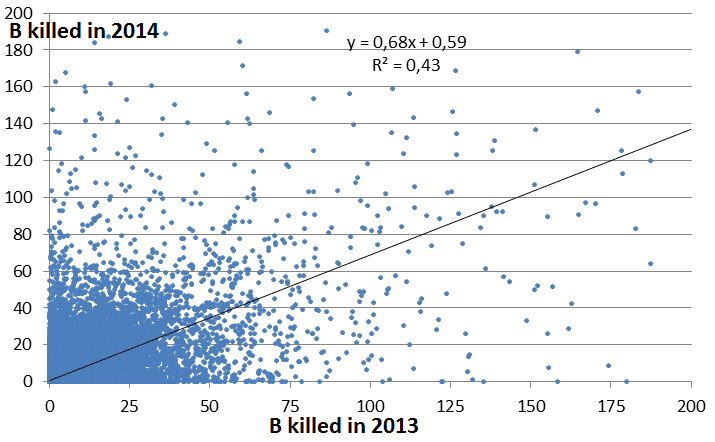 Newbies arrived in a random part of the year, making the average having only half year to get kills. This means that newbies have similar damage/month as veterans. Also, these are only averages. If we ask "if Joe did X in 2013, what will he do in 2014", the linear fit on the 2013 active pilots can answer: And the answer is: no cake for you! The 0.43 R2 is very low, so the last year performance is a very poor predictor for this year. You can grab a newbie and you aren't much worse off. So much for the myth of the veterans! If Eve as a 50% churn rate, then it must be working through its target audience pretty quick and will eventually bleed out. Is it a new phenomenon, or just something that happened in recent years? Wonder how many people that appear as newbies in 2014 are actually returning players from earlier years. Your metric is flawed. Veteran pilots will often naturally gravitate towards support roles (capital logistics, good interceptor/interdictors pilots etc.) that do not generally generate damage on killmails. @Stan: define "ganking" in a way that everyone agrees. Good luck! @Anonymous: For pilots, equal damage contribution is used. So the dictor/ceptor gets the same amount of kill as the DPS. Sure, logistics don't, but I doubt if all veterans are flying logi. And this statistic is relevant because EVE is a pvp game? No, it is not!!!! Just compare how much more PVE activity there is, and how much goods and assets are created, these activities outperform "peeweepee" every single day! PVP is just an aspect in EVE and totally irrelevant, or, just as relevant as other activities. It is just a PR propaganda, that PVP in EVE "mattered", no, it does not! This is one thing you shamelessly lie about! Regarding solo pvp, ganking haulers and barges is not solo pvp, it's ganking. Getting cool frig fights, cruiser brawls or even engagements with t3 cruisers, that is, what average people consider solo pvp. Just look at the videos of Abbadon21, i.e. I believe there is another point you missed (unless you compensated for this in some way I didn't see). All of the veterans started getting kills January 1, 2014, hypothetically a full year of activity. The newcomer could have started in December, and only have one month worth of kills. If we assume an equal number of newcomers start doing PvP every month, the average "age" of a newcomer would be roughly half a year. If they are doing half the damage of the veterans in half the time, this would mean their overall performance is actually the same. Sorry, but I just want to check that your base assumption is that player age is equivalent to PvP damage done? This data doesn't show skill points or age of characters, and is an analysis of PvP activity. Anecdotally; I didn't start PvP until my character was already 2 years old. I know of some players who've been in since Beta, and have never done PvP. If they were to start In FW tomorrow, they'd have all the relevant skill points maxed already. You've re-defined 'New Player' as simply 'New to PvP', so your conclusion is flawed. You'll need to include a comparison to skill points to actually make any conclusions about actual player age. Most players don't do PvP ever, so player age has very little correlation with any kind of PvP stat. 99smite And this statistic is relevant because EVE is a pvp game? Gevlon doesn't talk about the CCP PR! EVE Online is a massively multiplayer online game set 23,000 years in the future. As an elite pilot of one of the four controlling races, you will explore, build, and dominate across a universe of over 7,000 star systems. Sandbox gameplay and advanced skill-based progression provide you with a truly unique experience as you rise to power among the stars. Takes sides in factional warfare. Join an alliance and wage epic battles for sovereignty over star systems. Discover wormholes leading to unknown regions of space. Uncover pirate outposts and lucrative resources hidden in the far reaches of the cosmos. The possibilities are endless in EVE Online. Gevlon isn't talking about that. He talks about community perception/myth created and formed by the playerbase. "Most players don't do PvP ever, so player age has very little correlation with any kind of PvP stat." I agree, but then you need to use terms other than Newbie, and Bitter Vet. These apply to PvE players too. What you've demonstrated here is that experience/length of time in PvP does not necessarily mean you will succeed more. Which we can take to mean that there are veteran PvE players dipping into PvP, who know the mechanics of the game well. On the other side, we can say that there are PvP players who never learnt the mechanics of the game, or are still learning. Frankly the data could also show players returning to PvP after being absent for a year whilst they engaged purely in mining or trading. Then we can't even say that length of time in PvP is equivalent to experience (at least as far as this data set goes). Some of those newbies could have been PvP vets since Beta. Either way, it still doesn't invalidate the 'death by low skill point' excuse! "Either way, it still doesn't invalidate the 'death by low skill point' excuse!" Your right here, I don't even see how that can be invalidated. It's simple logic. Someone with level 5 in navigation, shield, core and gunnery skills is going to have better fittings and better stats than someone with level 4. If those two have exactly equal real world skill, then the skill points will win. A week old noob might be able to do some pretty good damage and can even turn the tide in fleet fights, but to suggest he's not at a disadvantage to veteran characters is simply wrong. @Rob: simple, the effect of skillpoints is irrelevant compared to the player being moron or slacker or not. And the charts clearly proved that. Your data shows participation... there's no comparison with skill points, or even quality of pilot for that matter. You only look at damage done. This doesn't tell us if people are succeeding in the game, or even how many fights they win. Also: "Secondly, the newbies are better than the bittervets and the several-years old and still progressing veterans are only 5x stronger"
You can't draw conclusions about several-years old pilots with this data, since that information is not included. Furthermore, you seem to think that 500% more damage done per pilot is not much? The data gathered is nice to see, but it absolutely doesn't show what you say it shows. The 500% is between "those pilots who keep playing and keep improving" vs "any random newbie". Not really a fair comparison. "Play to win" vs "Play for ego"
Don't play World of Tanks! 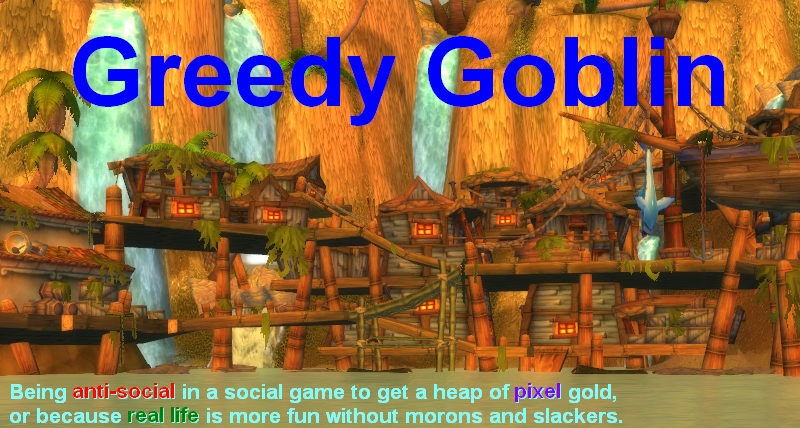 Global Chat: Can you play WoW Classic casually?